Our little backyard urban garden continues to grow and we're now at the stage where we've been able to enjoy and preserve some of the fruits of our labor! Today, we want to talk about beans. 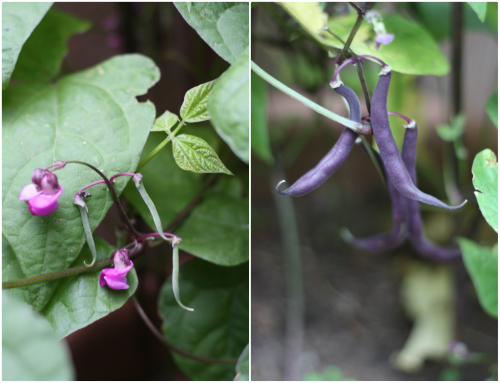 You may recall we planted some purple bush beans in a little container a few months back — well they grew quickly, producing some of the most beautiful purple beans we've seen. 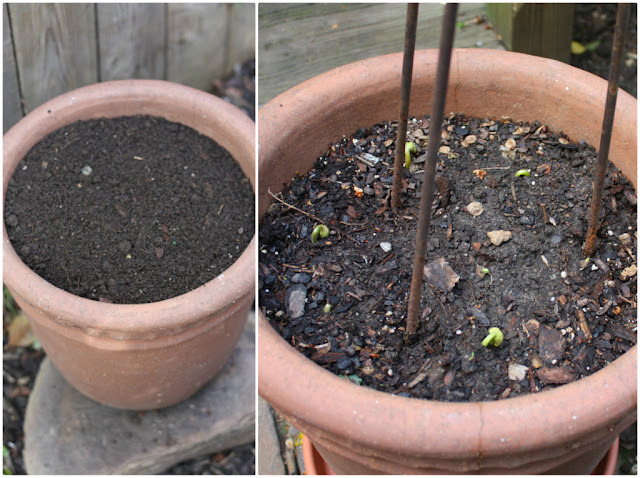 It was our first time trying to grow bush beans, so we were quite tickled that they did so well. First they sprouted beautiful purple flowers before producing the colorful beans — it was a lot of fun to watch them grow. Once the purple beans reached full maturity we snapped all of them off from the main plant and brought them inside to get cooking with! I knew exactly what I was going to do with these guys — I've been craving spicy dilly beans for a while now and actually had a few other bean varieties on hand from our Farm Table box deliveries and a recent trip to the farmer's market to mix them with. This also gave us the perfect opportunity to use more of that dill we've been growing from seed too (our box herbs finally sprouted)! Trim and blanch beans. Combine water, vinegars, salt and sugar in a saucepan and bring to a boil, boiling until salt and sugar have dissolved. 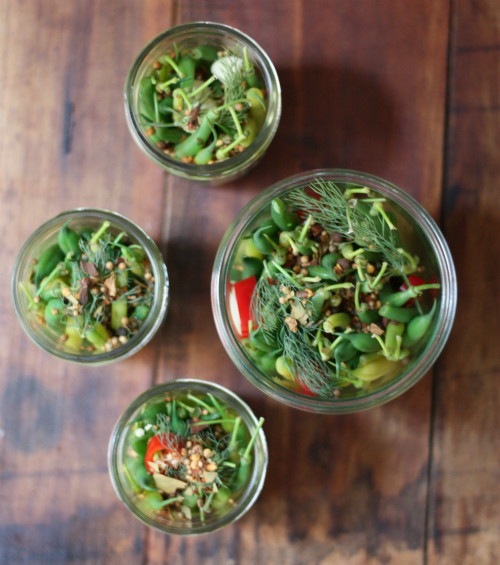 Divide chile pepper slices, garlic cloves, fresh dill and pickling spices among jars, then pack in beans tightly. 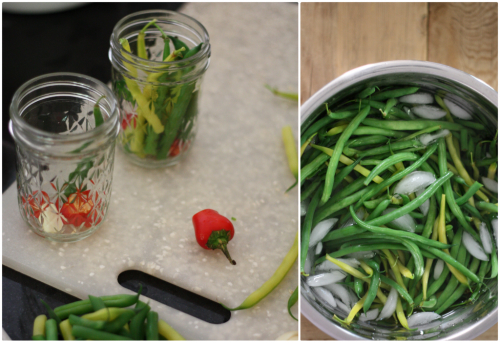 Pour hot brine over the beans, filling the jars and sealing tightly. Let cool, transfer to fridge and let them do their thing for 2-3 weeks while you wait patiently. Jars will keep 3-4 months in the fridge. Find the full play by play with more recipe details here. If you haven't tried dilly beans, they are amazing — packing a big punch and some good crunch in a small bean. They are awesome to just eat straight from the jar, as a relish or one of my personal faves — in a spicy Bloody Mary. 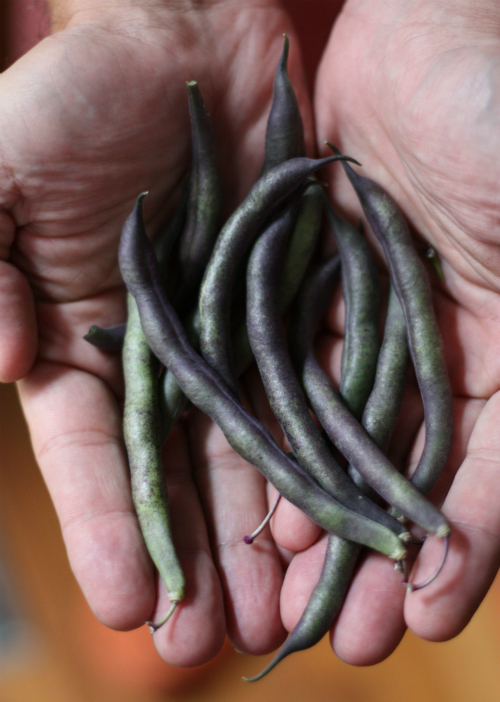 What's interesting about purple beans is how they turn green once harvested and cooked. 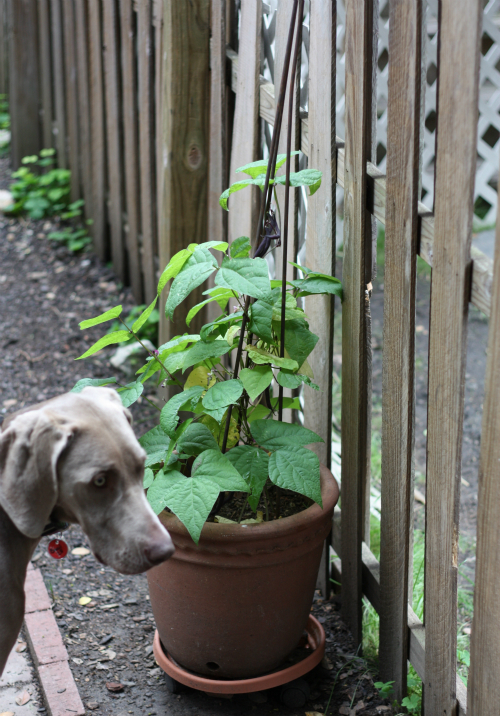 As for the bean plant — we've continued to water it each day and are already seeing new buds and beans! 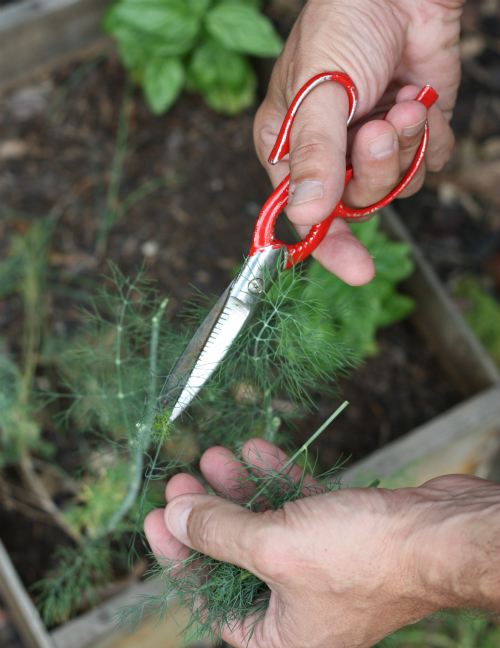 Are you having success with your garden or any particular plant this season? 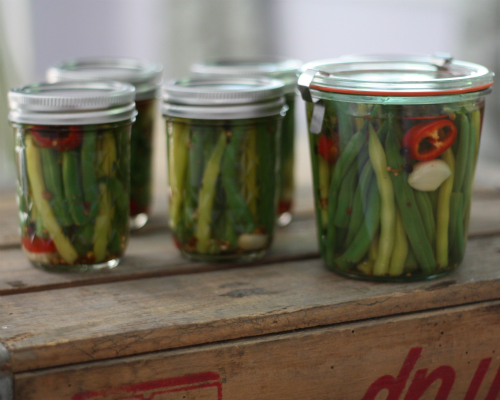 Have you tried canning or have a great recipe we should know about for beans? Yum, I absolutely love dill! I need to start canning and pickling veggies; it seems like everyone in my family makes something. My uncle makes a killer relish every year; my ukrainian mother in law puts whole tomatoes in a jar with vinegar and a variety of spices, the tomatoes come out so juicy and filled with flavor! My brother in law packages a variety of veggies with hot peppers and pickles them slightly; they come out crunchy with a serious kick. Your beans look amazing! Lauren, you're killing us with all the canned goodies your Eastern European family makes! With our Hungarian backgrounds, we are right there with you! Hope it went well Annie!! I've made hot dilly green beans for years! So fabulous. Thanks for getting the "How To" out there! Thanks Chrysalis — we just love this time of year when the bounty comes in and we can get canning! I picked up some green beans from Deer Run Farm today. I will be making these this weekend. Thanks for the recipe. Yay! Let us know how things turned out!